KIEV, Ukraine -- Ukraine's ousted president Viktor Yanukovych and his ally, former Ukrainian Prime Minister, Mykola Azarov are now officially Russian citizens and, consequently, are under the protection of the Russian Federation. 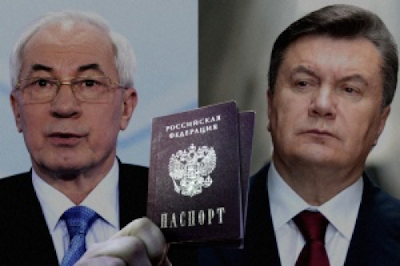 Yanukovych and Azarov obtain Russian citizenship and protection - Transparency International. This was reported by Transparency International investigators within the framework of their 'Unmask the Corrupt' project. The report says: "All evidence indicates that Yanukovych and Azarov received the Russian citizenship and are placed under the protection of the Russian government. Azarov seems to be willing to get back to Ukrainian politics at any time, even if he has to give up his Russian citizenship in this case. On the other hand, the former Ukrainian President does not show any signs of trying to return to politics." Here is another important finding of the report: the gradual lifting of the sanctions against relatives and representatives of Yanukovych and Azarov allows them to sell properties they acquired, presumably, through corrupt practices. The investigators report: "Reselling assets to complicate main beneficiaries' identification was largely observed in Ukrainian and off-shore companies whose beneficiaries are supposedly families of Yanukovych and Azarov. The same thing may happen to assets that are currently placed under the EU sanctions." Thus, neither Ukraine nor European countries cannot compensate for losses caused by Yanukovych's and his allies' corrupt schemes. This casts doubts on the effectiveness of the international anti-corruption measures. Yanukovych fled his opulent mansion outside Kiev in February 2014 following mass protests against his decision to reject an E.U. Association Agreement and move the country towards Russia. The new Ukrainian government says Yanukovych and his associates stole tens of billions of dollars during his tenure. As of January 13, 2016, former Ukrainian President Viktor Yanukovych was on the top of the list of the world's most corrupt persons according to Transparency International's Unmask the Corrupt campaign. Mykola Azarov, Ukraine's last prime minister under Yanukovych. On August 3, Azarov who is now living 'in exile' in Moscow formed the "Ukraine Salvation Committee," whose goal is "regime change" back home. Azarov is wanted in Ukraine for several crimes, including embezzlement and abuse of power.